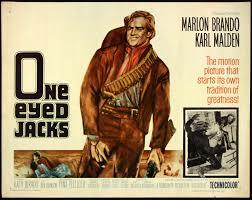 The only directorial credit for Marlon Brando was this very adult western - still a pretty daring concept for 1961 - for which the mercurial and increasingly rebellious star Brando took over filmmaking chores after original helmer Stanley Kubrick withdrew because of (all together now) creative differences. Now Stanley Kubrick, as we all know, was notorious for overshooting, exposing take after take until he figured he had perfection. Tyro director Brando took it even further, exposing more than a million of feet of celluloid and ballooning the budget thricefold, ultimately costing Paramount a then-astronomical $6 million. The producer claimed that Brando may well have shot literally more than a million feet, a world record. Maybe that’s hyperbole, but the resulting film was a box-office disappointment, needless to say. But it is still respected by many. Of course, it helps to be a Marlon fetishist. Brando is Rio, a bank bandit whose raids along the Mexican border go on hold when his disloyal partner, significantly named Dad (Karl Malden) abandons him to a posse of Mexican police. Escaping prison five years later, Rio hooks up with some other outlaws and heads for the Monterey Peninsula, where Dad has done a career-180 and become a benevolent-despot sheriff and straight-arrow family man. Rio's vague revenge scheme involves emptying the Monterey bank, but when he sees Dad now has a pretty stepdaughter, the plans start to change. The girl is portrayed by Audrey Hepburn-ish ingenue Pina Pellicer, who would commit suicide at age 24 after a brief career in Mexican cinema. Wannabe actresses, please take note. Word is that the basic dynamic in the movie derived from real-life western lore of the relationship between the notorious Billy the Kid and his nemesis Pat Garrett. For all the behind-the-scenes drama and excess, ONE-EYED JACKS is a sturdy, if lengthy and anticlimactic psychological oater, with trace echoes of CAPE FEAR.